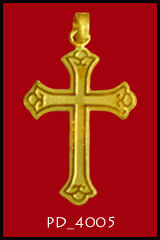 Baht gold crucifix 23k - Thai Baht gold cross & gold Amulets. 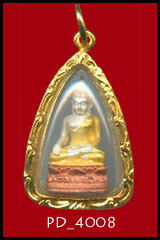 Thailand Gold Jewelry is a western managed company of Thai Baht Gold Pendants in weight sizes starting from 1/4 Baht to 5 Baht in gold weight. To view some of the most popular pendant styles, click the navigation buttons located under the featured picture above. Thailand Gold Jewelry's Thai Baht gold pendants and Thai Baht gold crucifixs are manufactured by our skilled goldsmiths and certified as 23K Baht Gold, which is 96.5% pure gold by product weight. 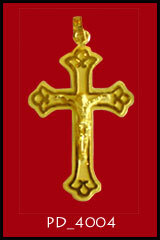 This makes Thai Baht gold pendants and crucifixs a great way to invest in the gold market and also have an object of beauty. Thai Baht gold has been commonly referred to as the currency of the Orient and is often used as an altrnate currency that has real value worldwide. When ordering your pendant please specify the Baht weight desired and the item number. Thailand Gold Jewelry's web site displays some of our most popular Thai Baht gold pendants and Thai Baht gold crucifixs for easy viewing. 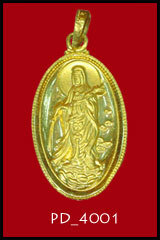 Thai Gold Jewelry has additional styles not shown and can also make custom designs to meet the customer's requirement. If you prefer to have your own custom design, please email a picture in JPG format to us and we will respond with a quote. Selling a 23k or 24k Thai gold is like selling or exchanging money. We sell F.O.B. Thailand and arrange the shipment direct to you. We do not make refunds after the gold chain, gold bracelet, gold necklace, pendant or gold ring has been legally delivered to the common carrier for shipment to your designated location.